This website explains how Polydesmida are built. 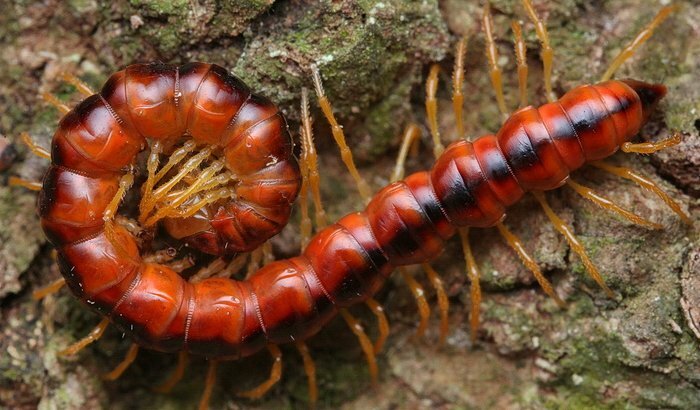 Polydesmida are one of the most successful groups of terrestrial animals, but they tend to be lumped with other millipedes as 'long, thin animals with lots of legs'. There is a lot more to see, and students, teachers and naturalists will find the details on this website. Use the menu on the left to navigate. If you know very little about Polydesmida, I recommend that you start with body plans and work down the menu from there. If you are not familiar with anatomy words such as 'distal' and 'caudal', you can learn about them on the anatomy terms page. There is no generally useful common name for Polydesmida. 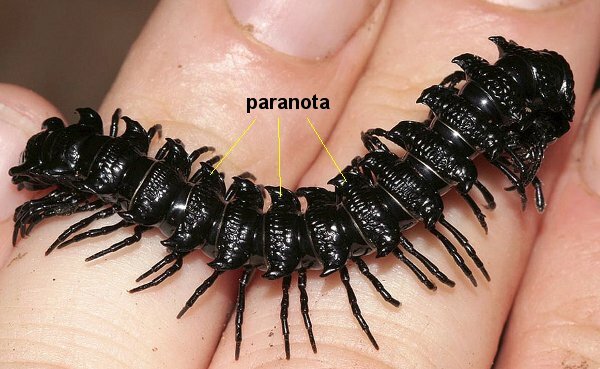 They are sometimes called 'keeled millipedes' or 'flatback millipedes' because many species have wide, flat extensions on their backs, called paranota (see image below). However, many other Polydesmida are shaped like simple cylinders: the paranota are either greatly reduced (see image at top of page) or entirely missing. The name 'Polydesmida' comes from Greek words meaning 'many' (polys) and 'bond' (desmos). It refers to the way the many body parts with paranota seem to be joined together by short bonding pieces. The reality is more complicated (see diplosegments). Polydesmida occur almost everywhere except Antarctica and the high Arctic. They are particularly diverse in tropical forests, but even in the temperate zone it is not unusual for a single patch of forest or grassy woodland to be home to 5-10 species of Polydesmida. Most Polydesmida live on or in the soil and eat rotting vegetation and fungi. Females lay their eggs in small chambers they build out of soil and/or faecal material. Juvenile Polydesmida build similar chambers in which to moult. Most Polydesmida probably live for 1-2 years. In places with a mild to hot climate and wet and dry seasons, Polydesmida spend the dry months deep in the soil or in moist rotting logs. Adults emerge during the wet season to disperse and to mate. In places where it rains through the year, Polydesmida can be surface-active in every month. In places with very cold winters, Polydesmida (like most soil arthropods) survive as eggs or juveniles in non-freezing shelters. Polydesmida are poor dispersers under natural conditions and seem to be very good at evolving new species. As a result, many polydesmidan species have small geographical ranges (100‒1000 square kilometres). Some Polydesmida are only known to occur at a single locality, such as a particular mountain. Polydesmidan genera are also good at forming distribution mosaics, in which each species occupies its own patch on the map and overlaps very little (or not at all) with other species in the same genus. A few Polydesmida have been unintentionally spread by humans and have become animal weeds in their new homes, especially in the tropics. None of these 'tramps' are seriously destructive to crops, but some, like the Asian species Oxidus gracilis in the USA, occur in huge numbers and are a nuisance around homes and gardens. Note: Unless otherwise credited, the text and images on this website are my own work and are copyright under a Creative Commons license (attribution + non-commercial, cc-by-nc). You are welcome to use or copy the cc-by-nc information and images on the External Anatomy of Polydesmida website for non-commercial purposes. Please cite the External Anatomy of Polydesmida URL in your work so that others know where you got the information. For permission to use images with rights reserved, please contact the relevant copyright holder.